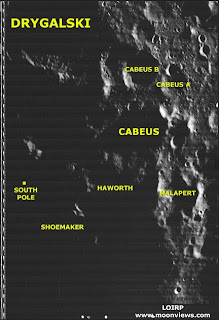 Tomorrow (Friday, Sept. 11th, 2009) at 10am PDT, the LCROSS team will announce the chosen permanently-shadowed, lunar South Pole crater for the impact of the Centaur upper stage of the launch vehicle. 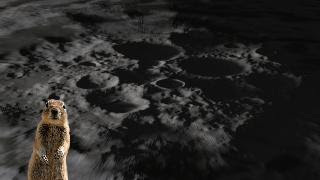 The lucky crater selected has been deemed the ideal target for evaluating if water ice exists at the lunar south pole. Anthony Colaprete, LCROSS principal investigator, will make the announcement and you can catch it live on NASA TV. 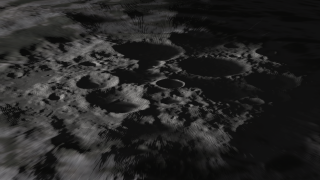 Inevitably, a small group of folks are quite upset about the idea of disturbing the lunar environment. I suspect they are afraid of disturbing the underground moon squirrels. Such is the chance we take in the name of exploration. "The LCROSS impact will excavate a crater approximately 20 meters in diameter, or about one-trillionth the total permanently shadowed area. 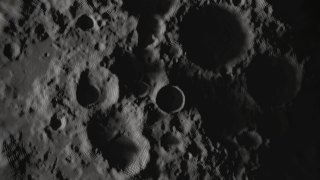 It is safe to say the LCROSS impact will not have a lasting effect on lunar water, if it does indeed exist." 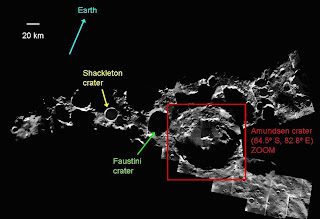 The following image was produced by NASA's Jet Propulsion Laboratory using the Deep Space Network's Goldstone Solar System Radar. 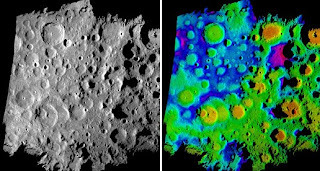 The left image is computer generated based on radar reflectance data, and the color image on the right is the highest resolution topography map to date of the moon's south pole. Of course there are a wealth of other images and data -- but there's a start. LCROSS is on Twitter and Facebook. The flight director is blogging on the mission. There is also a Google Group dedicated to Observation events (or backyard amateur observation tips) for the October 9, 2009 impact.